It seems to be that while driving, most people tend to pick on larger vehicles. Pickup trucks and large SUVs seemingly fall victim to being cut off and potential damage. This is why equipping your vehicle with the best dash cam for pickup trucks is essential. These unique devices give you the ability to monitor activity around your truck for hours. You’ll never know just how useful they are until you find yourself in a position when you need one. The WheelWitness HD Pro Plus is one of the better models on the market. It’s equipped with plenty of unique features including a built-in G-sensor. With 16GB of SD, you can store a lot of data while on the road. SD Card Included: With your order, you will receive the 16 GB SD card, so the camera is ready to use immediately. Automatic on and off: Once the device is plugged into your vehicle, it automatically turns on and off when the pickup truck is on or off. On-the-fly-zoom function: With the On-the-fly-zoom function, you can zoom up to four times while driving. It will continue to record as the zoom is adjusted. 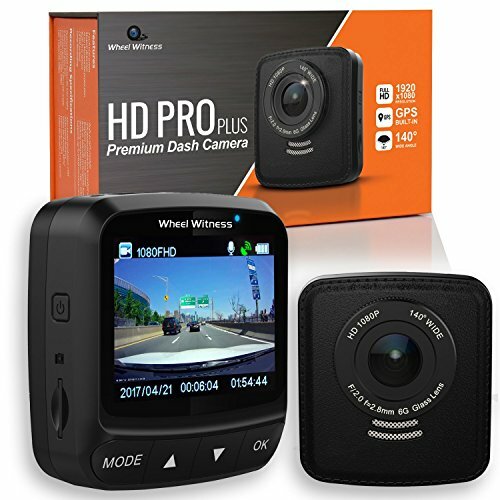 iOs and Android compatible: The WheelWitness HD Pro Plus Dash Cam makes it easy to transfer data. You can control the camera from your smartphone and instantly transfer videos and photos. Impressive video quality: Built with a Sony Exmore IMX322 CMOS Sensor and a six-glass precision lens, you can record in high quality. The lens is designed for impressive day and night time recordings. Locking feature: You can also lock any files stored on the camera, so they aren’t overwritten or deleted. The built-in G-sensor also locks abrupt events as soon as they happen. The Pruveeo D700 Dash Cam made it to our list of the best dash cam for pickup trucks because it has a more unique design than other dash cams. Designed with both front and rear recording options, all areas of your truck are covered. Seven-inch touch screen: You’ll love the touch screen to navigate through the menu options and adjust the camera. It makes it simpler than trying to use tactile buttons while getting ready to drive. High-resolution camera: The front camera offers 1080p recording. It’s also a 150-degree angle lens, which gives you an impressive wide-angle viewing experience. Auto parking image: When your pickup truck is placed in reverse, the rear camera automatically turns on. Additionally, you won’t have to touch any buttons to access the parking camera. Picture-in-picture: To keep an eye on all activity, make sure you use the picture-in-picture function. You can either use the main mirror screen to look at one camera or both at the same time. 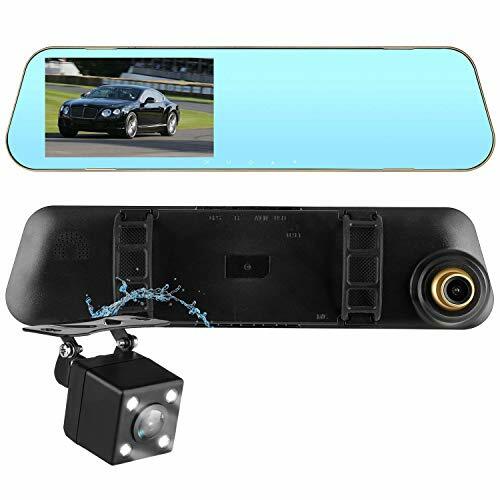 Rearview mirror design: You won’t need to install a separate camera on your dash or your window. Instead, the Pruveeo D700 is designed like a rearview mirror. All you just have to do is slip it on top of your existing rearview mirror. Built-in battery: In the event of emergencies, there is a built-in battery included with the unit. This helps to make sure that important recordings are captured when the truck is off. 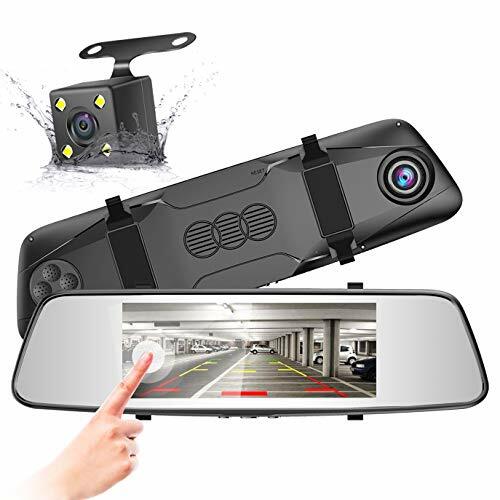 With a similar design to the previous dash cam, this one also slides onto your rearview mirror. It also has plenty of features most dash cams have such as 1080p recording and a built-in G-sensor. 1080p dual recording: Both the front and rear cameras are built with 170-degree wide angles. They also provide 1080p recordings that can be reviewed quickly. Waterproof rear lens: The rear-recording lens is IP68 waterproof. It is also built with four LED lights to help illuminate the rear of your vehicle for parking. Built-in IR night vision: When driving at night, you’ll appreciate the IR night vision. It will automatically switch to this mode in low-lighting situations. Built-in G-sensor: The mirror car camera is built with a g-sensor. This helps to record any abrupt movements and marks the recordings, so they aren’t overwritten. Anti-dazzle optics: For the rearview mirror attachment, you don’t have to worry about glare. It’s built similarly to a traditional rearview mirror with the anti-dazzle optics. The camera also features a cobalt glass lens for pristine image quality. Sleep mode: When the car is off or when you stop driving, make sure you put the camera into sleep mode. This will turn the screen off of the camera to preserve battery life when the car is off. Dual-strap mounting: The rearview mirror attachment is easy to install. You won’t need screws, as all you need to do is use the dual straps to mount it in your truck. Three display modes: You can choose three different display modes including rear, front, and dual view. It’s important you find the best dash cam for pickup trucks that you can trust. You’ll want a device that records your every movement without needing to be turned on. You will also need a camera that captures high-quality videos. Our pick for the best dash cam is surely the DohonesBest Dash Cam because both the front and rear cameras offer 1080p recording. There is also a built-in G-sensor to capture abrupt movements. Not to mention you can also view the camera in three different modes, including dual. You’ll also appreciate how simple it is to install. However, you may be required to purchase a longer connectivity cable, especially for pickups. Overall, if you’re looking for a device to cover all areas of your large truck, this is the one to choose.